Here presenting their fifth album, Greek five-piece Acherontas have laboured for a while in the orthodox black metal market without standing out, and the intriguingly-titled Ma-IoN (Formulas of Reptilian Unification) may go some way towards altering that. 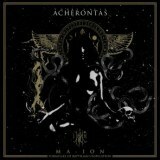 Although on the surface playing a straightforward sort of black metal that owes much to the Deathspell Omegas and Watains of the world, Acherontas have a taste for atmosphere that makes their music immediately gripping. The opening of the album, for example, is dark and creepy, intro piece Fires of Prometheus setting a scene for the tumultuous battery of Nereid Tide of Neptune's Rudra to have full impact. Acherontas seem less interested in the experimentation that colleague Charles noted in his review of the band's 2011 opus Vamachara – any deviations from black metal here are in the frequent incantatory interludes, such as Convolut-ion, Manifestat-ion, Secret-ion, Karma-lravatl the Thunders Emerged, occult whispers beneath a shimmering ambience and metallic scraping of some ritualistic bell. It's very effective in terms of atmosphere, although the band shot themselves in the foot by making the album over seventy minutes long – there is far too much music here, and a shorter, tighter album would have been far better. Still, what we have is good for the most part. Interlude Permutation in the Aetheric Void (Ma-Ion Sacred Seal) is dark and chilling, with throat-singing and almost tribal percussion, leading into a trio of long tracks that starts with the eight-minute Shaman and the Waning Moon, another ritualistic piece with rhythmically-strummed acoustic guitar atop percussion and creepy ambience. Lunar Transcendence & The Secret Kiss of Nut shows the band's strengths when focused on black metal, however, even at over eleven minutes, mid-paced yet driving onwards, melodic yet dark and gloomy. Yes, there's a mid-track ambient section which feels self-indulgent even by Acherontas' standards, but it works in place and really, if you're listening to this album in the first place it's likely that you'll have a tolerance for it. Even the following eleven-minute The Awakening of Astral Orphic Mysteries - Behind the Eyes of Irida works, with more of a Native American feel and more spoken vocals over an almost Drukdhian black metal storm. By the time you've reached concluding tracks Therionic Transformation (a slow, despondent march that soon propels itself into blackened violence) and outro ambient piece Orgiastic Feast of Flesh, Beheld Thine Vicissitude, the album's length does hang heavily. Yet it's a surprisingly enjoyable seventy minutes, certainly the best material I've heard from Acherontas and enough to make this an easy recommendation to those seeking dark ear candy.